Jett Webb with his massive wild hog. Image screenshot of video on witn.com. One Conetoe, North Carolina hunter is being lauded as a bit of a celebrity after harvesting a wild pig upwards of 500 pounds in Bertie County. According to WITN, Jett Webb, 34, took the large animal on February 28 with an AR-15 rifle chambered in .308. “Clean kill, dropped him, stoned him right in his tracks,” Webb recalled. The hunter and his companions loaded the seven-foot-long pig onto a 4×4 and took it to the White Oak Ranch Hunting Club for the weigh-in. The club’s certified scales only went up to 500 pounds, which the pig maxed out. 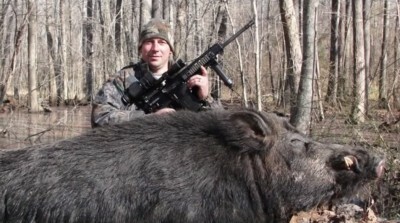 Club president Michael Mansell told the North Carolina Sportsman that the hog likely weighed much more.